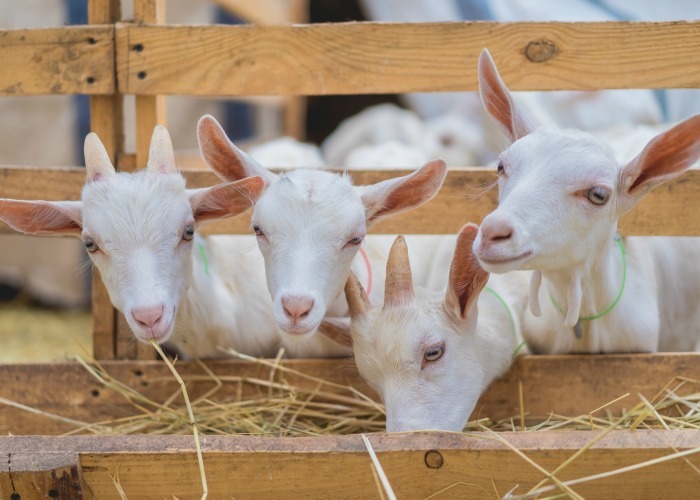 When you first decide to dive into the wonderful world of goats, choosing the best goat breeds for your family can be quite an overwhelming decision. You need to ensure the breed you choose has all of the benefits you are looking for without any of the characteristics that might just be too much for your family to deal with. 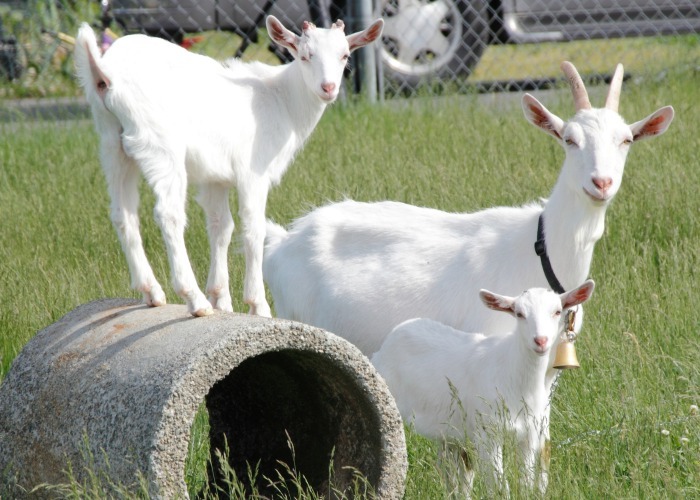 This goat breeds list will help you pick the best fit. Some goat breeds will offer a higher fat content of milk which is great for baking and cooking, however, that same breed may tend to be a very loud goat yelling for need and for fun. Yes, the milk is amazing, but if you live in an area where your neighbors are very close you might not want a goat that loves to sing. Another thing to consider is your environment. Some goats do well in the cold, while others in the heat. Some goats do not tolerate wet weather at all whereas some do just fine in the damp. 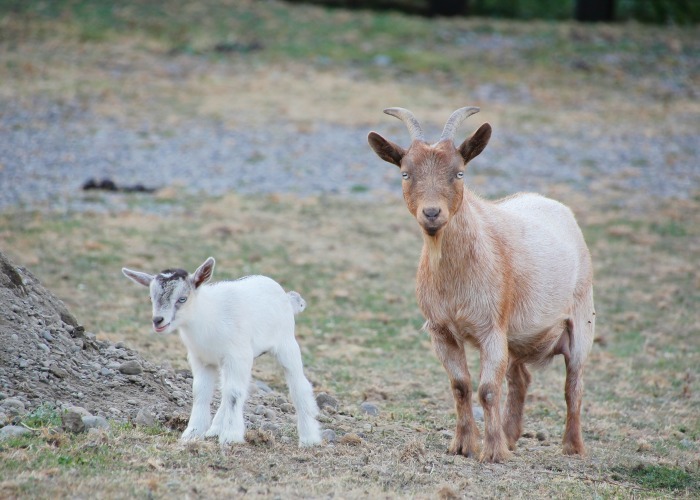 Knowing the hardiness of the breeds is the key to an easy life with goats and a hard one. To help I am going to go over the basics characteristics of each of the most popular breeds to help you best narrow down the best fit for you, your lifestyle, and your family. Alpines are a medium to a large-sized goat that is best known for their milk production. If you are looking for volume then this is your goat! They have a long straight nose with tall ears and a low raspy call. They weight about 135 pounds and stand at about 30 inches tall. they have nice large teets which makes them a bit easier to milk like the Nubians. If you have issues with your hands such as arthritis or carpal tunnel, larger teets are much easier to milk. They are a friendly goat that tends to be strong-willed at times. A bit tricky to train but with a strong routine and a lot of consistency it can be done. They have a smaller butterfat content at 3.4% so they are all about the quantity here! Producing up over a gallon a day keep this in mind if you have a small family and don’t want more milk than you can handle. Overall a good choice of milk goat for a farm with older kids. Physical – Tall ears with long straight nose and may have a beard. Manner – Friendly and docile. Can be a bit stubborn. A short a stalky goat that is mainly for meat production with a fun and silly mannerism that makes this a favorite of ours. 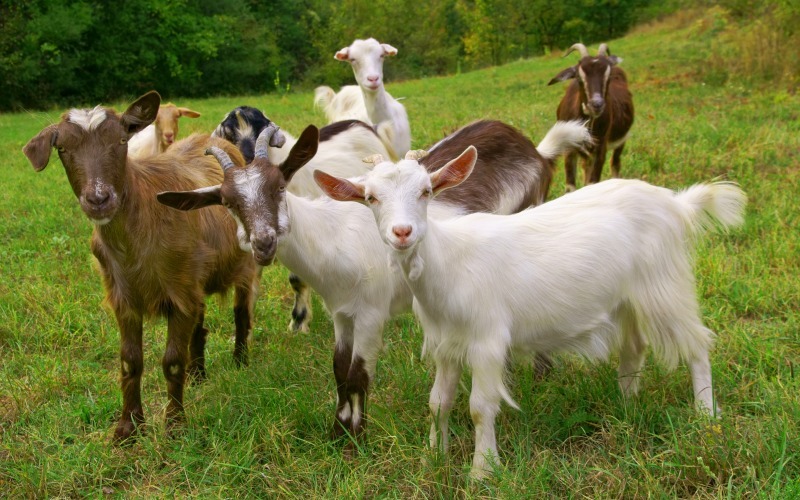 Boer goats are resistant to disease and tend to do well in hot dry climates. Mainly a white goat with brown heads they have long pendulous ears with a short face. They tend to gain weight faster than other breeds with the average full weight being 120-200 lbs for does and 200-350 lbs for bucks. Does are known to be wonderful mothers even superior to other breeds. They are very docile, even the bucks and are eager to learn. Because of that, they can be easily trained as long as you work with them early. A skittish Boer goat will take a while to turn around but it can be done if you are patient. Since Boer goats are bred for meat the does tend to make just enough milk for the kids and are not in milk very long. You can milk them, but the production will be much lower than a dairy breed. Overall a wonderful addition to any farm looking for meat. Size – Average height with a larger weight. Physical – Short stalky goat with thick legs and a broad chest. Breeding Season – Year round with August-January the most common time. Milk production – Up to 1/2 gallon a day if they have a good udder. Manner – A docile goat but can be timid if not worked with early on. Kiko goats are another breed of meat goat that is a lot like the Boer goats mentioned above. A durable goat they tend to kid very well with little or no assistance. They have straight noses with medium length ears. Most are white but can have a variety of colors as well. Labeled as an independent goat they will live just fine with little human interaction. For this reason, you will have to work to train them if needed. They can be milked but like the Boar goat, they will produce for a much shorter time than the dairy breeds. Kiko’s are known to be worm resistant, hardy and great mothers might explain why they seem to be growing in popularity. A heavier goat does average 100-150 lbs with the bucks more at 150-200 lbs. Overall Kiko’s are a great meat goat addition to any farm. Physical -Short stalky goat with thick legs and a broad chest. Manner – An independent goat that will do well on their own. These goats are best known for their tiny ears (gopher ears) that may look as if they have none at all. They are a smaller breed of goat with a similar build to the Nubian. A very calm and docile goat they are known for producing lots of butterfat-rich milk. Milk production time can last up to two years without rebreeding so if you are looking specifically for a good milker, this is your goat. Lamanchas do well in a variety of climates and their calm nature makes them a wonderful family goat. They love human interaction and make great pets. Does tend to weight 130 lbs where the bucks are closer to 165 and both stand about 30″ tall so their size is not too intimidating. Overall Lamancha goats are wonderful additions to any milk producing farm. Physical – Gopher ears with a long straight face. A cute miniature goat that is gaining popularity with more of the smaller homesteads. Because of their smaller size, they are a great fit for young families and do well around children. They have a friendly nature even the bucks and for that reason a great family goat. Since they are on the smaller side they require less room than the larger breeds are a great way to get your feet wet with dairy animals. They do have small sometimes tiny teets and milking usually requires just using your fingers rather than your entire hand. If you have issues such as arthritis or carpal tunnel you will want to keep this in mind. Nigerian Dwarf goats have upright years and short straight noses. Their fur is short to medium and they stand about 19 inches tall for the does and up to 23 inches for the bucks. A good healthy weight for Nigerians is about 75lbs. Overall Nigerian Dwarf goats are a great breed to have on a family farm. Size – a Small breed of goat. Physical – Straight noses and upright ears. They can be any color or pattern. Manner – Docile, gentle and friendly. Great for young families or companion animals. The Nubian goat is considered a dual purpose breed of goat. This large breed goat is really known for their long pendulous ears and a roman nose. These goats tend to do well in the hot weather and have a longer breeding season than other goats. Since they are larger they require more space than the smaller breeds. Overcrowding is never good with any animals especially goats, so be sure you have space before you buy – both inside and out. Nubians have a higher butterfat content of about 5% or more which gives their milk a lovely flavor. They are not a top producing goat as some of the others so keep that in mind if the quantity is more important than the specific taste. They can produce up to a gallon a day. A larger goat, a full-grown Nubian doe can be around 30 inches tall with the bucks hovering at about 35 inches. Average weight is 135-175 pounds with the bucks well over 200. A very friendly goat that is pleasant to work with and easy to train since they love human interaction. Because of their large size might not be a good fit for families with very young children. They have longer teets that make it a good choice for milking especially for an older owner such as myself. Having a large teet to grip makes hand milking much easier. Nubians are loud and can (but not always) yell if they are hungry, bored, in heat, or just plain happy. They are the loudest when in heat so if you do have neighbors just a bit of warning beforehand will usually be enough to keep any complaints away. They have medium hair with the American breeds a bit longer and something to keep in mind if you live in a very hot climate. We find that clipping them at the beginning of each summer really helps to keep them cool. Overall Nubian goats are a wonderful fund breed to have especially if your children are a bit older. Known for their beautiful coats and striking colors, Oberhasli is a great family milk goat. They are a very friendly goat and do not frighten easily like the other breeds tend to do. These goats are used as pack animals since they love to work and do well in a group. 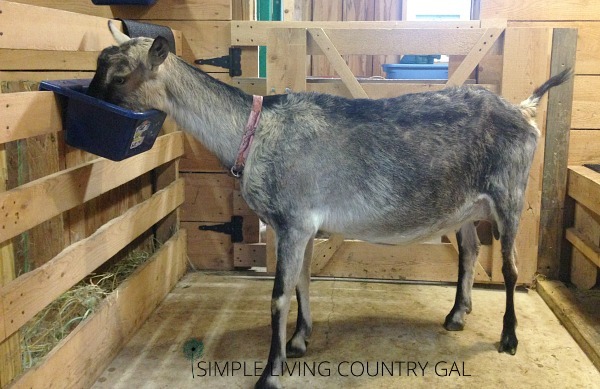 They are a quite docile goat making it a good fit for backyard homesteaders. They are great milkers producing up to 1 1/2 gallons a day. Does are around 28″ tall and weigh around 120 lbs with the bucks averaging 34″ and weighing 150 lbs. Some breeds may not do well in wet climates so you will want to ask plenty of questions when purchasing to ensure they can tolerate your climate well. 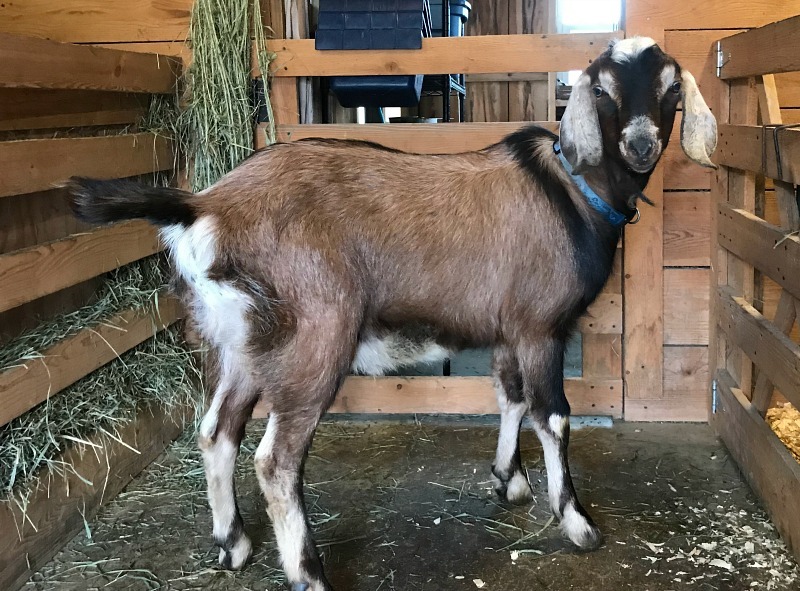 Overall a great working dairy goat that has a smaller size making it a good fit for a young family that lives in a dryer climate. Physical – A variety of colors with the telltale black dorsal fin. They have straight ears and a short face. Manner – Quiet and docile. Best know for it’s all white color, Saanens have short straight ears and faces making them easy to spot in a herd. A larger dairy goat, they are a high quality and high volume milker. A very friendly goat, it is a favorite among dairy owners and because of their gentle nature they are a great fit for families with young children. Because of their larger size, they are known as the gentle giants of the goat world. Does average 145 lbs and 31″ tall with the bucks closer to 200 lbs and 35″. They have a lower butterfat content and are large producers tending to do well in just about any climate. Their resistant to disease is just another plus for this breed. 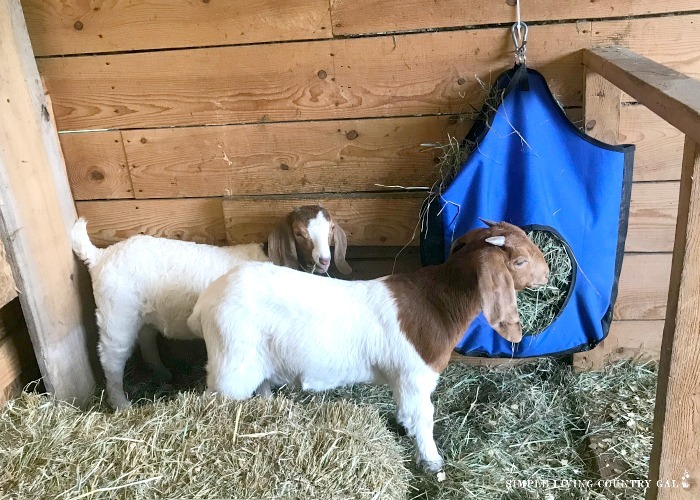 Overall and wonderful dairy goat for young families or a new goat owner. Physical – White with straight ears and beard. 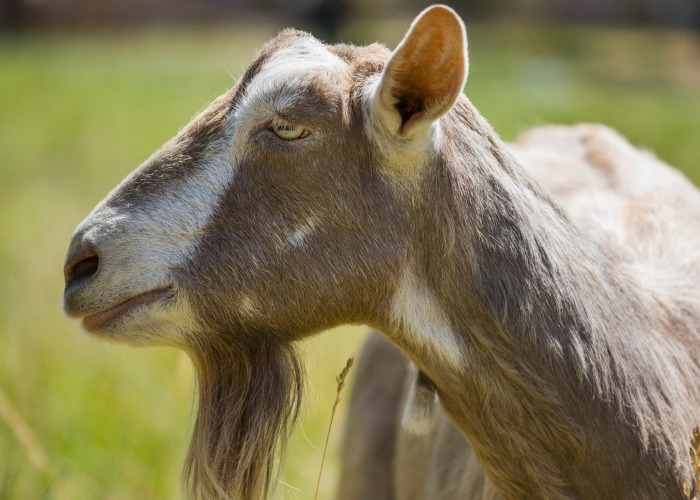 A Toggenburg goat is probably the oldest known dairy goat that is a great milk producer with a lower butterfat. Most Toggs tend to have wattles (appendages on the throat) which is just another wonderful trait of this dairy animal. They are medium in size and can vary in colors from tan to gray. They look similar to the Alpine sporting beards in both does and bucks. They are very alert goats that are calm and affectionate. Toggenburg does height around 30″ and the bucks at 36″. Weight for a doe is usually around 125 lbs with most bucks closer to 200 lbs. They do best in colder climates and are great mothers. Overall a great heavy producing goat that will fit with any family that loves milk! Physical – Resembles the Alpine goat with straight ears and face. Hair – Short to medium. Manner – Friendly and alert goats. Even though this list does not cover them all, it is the most common types of family goats found in the US today. Finding the best fit for your family’s age, size, and location are all things you really do need to consider before investing in a goat. Be sure to do your homework before bringing them home to ensure you have the best breed for your environment. 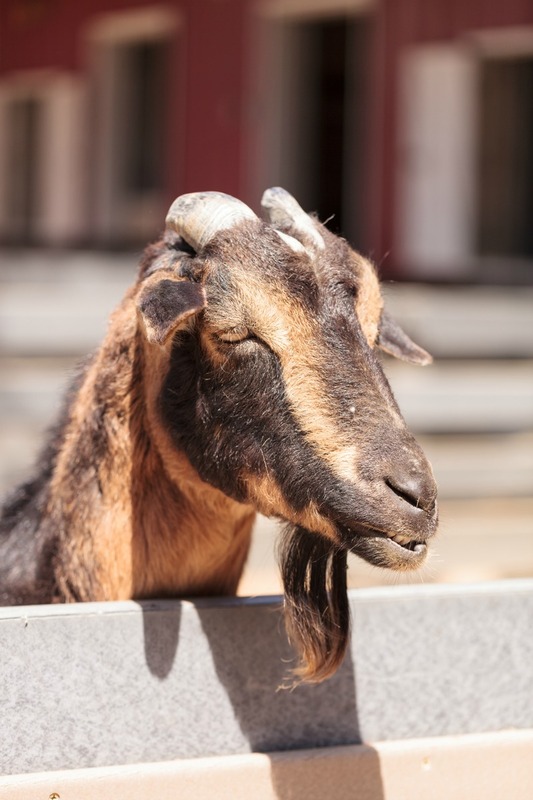 A healthy goat is a happy goat so adequate housing, fresh water, forage, and feed are all factors you need to consider BEFORE bringing hem home. Having a fridge full of fresh milk, delicious cheese and butter are just some of the perks you get when you have goats on your homestead. Not to mention the endless supply of entertainment you are sure to have with any breed. Add that to their loving and quirky personalities and you might just find goats the best way to add a bit of fun to your homestead. 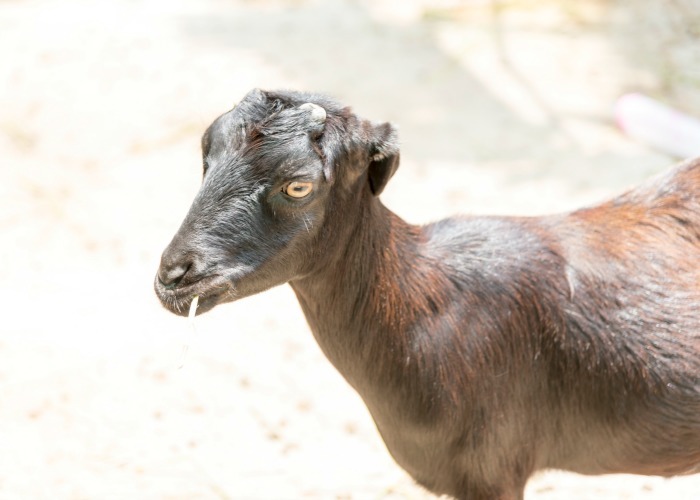 Do you have any favorites that are not on this goat breeds list? Comment below, I would love to hear from you! Can you breed a Nubian buck to alpines and dwarf Nigerians or should I have two bucks with size difference. You can technically breed a Nubian to a Nigerian dwarf, but it is not a good idea if you have a full grown buck. When breeding you need to be sure of a few things first. 1. That your doe can handle the weight of a bigger buck. If not you can severely hurt your does. 2. That your does are old enough to be bred. It is recommended that does be at least 10 months old, but we wait for at least 1 year here before we beginning breeding. 3. If the buck is a large breed Nubian then he may throw large breed kids that can be a danger to your doe. If she is a first freshener then the chances of a single kid are higher which is not a good scenario. Single kids tend to be larger than multiples and can be difficult to deliver if a dwarf doe. If it was me, I would not do it. To get a Mini Nubian it is better to use a Dwarf buck with a Nubian doe. What a great rundown of the different breeds! I want to add goats to our farmstead this summer, and I will definitely be saving this post to read again as we finalize our plans. 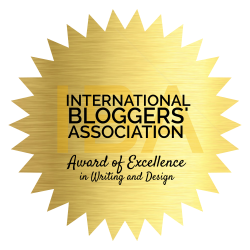 Thank you so much for sharing on the Homestead Blog Hop! I am so glad you found it helpful, Lacey!